“Procedure when party fails to present written statement called for by Court.- Where any party from whom a written statement is required under Rule 1 or Rule 9 fails to present the same within the time permitted or fixed by the Court, as the case may be, the Court shall pronounce judgment against him, or make such order in relation to the suit as it thinks fit and on pronouncement of such judgment a decree shall be drawn up. Provided further that no Court shall make an order to extend the time provided under Rule 1 of this Order for filing of the written statement.” A perusal of these provisions would show that ordinarily a written statement is to be filed within a period of 30 days. However, grace period of a further 90 days is granted which the Court may employ for reasons to be recorded in writing and payment of such costs as it deems fit to allow such written statement to come on record. What is of great importance is the fact that beyond 120 days from the date of service of summons, the defendant shall forfeit the right to file the written statement and the Court shall not allow the written statement to be taken on record. This is further buttressed by the proviso in Order VIII Rule 10 also adding that the Court has no further power to extend the time beyond this period of 120 days. 10) Several High Court judgments on the amended Order VIII Rule 1 have now held that given the consequence of non-filing of written statement, the amended provisions of the CPC will have to be held to be mandatory. [See Oku Tech Private Limited vs. Sangeet Agarwal & Ors. by a learned Single Judge of the Delhi High Court dated 11.08.2016 in CS (OS) No. 3390/2015 as followed by several other judgments including a judgment of the Delhi High Court in Maja Cosmetics vs. Oasis Commercial Pvt. Ltd. 2018 SCC Online Del 6698. 11) We are of the view that the view taken by the Delhi High Court in these judgments is correct in view of the fact that the consequence of forfeiting a right to file the written statement; non-extension of any further time; and the fact that the Court shall not allow the written statement to be taken on record all points to the fact that the earlier law on Order VIII Rule 1 on the filing of written statement underOrder VIII Rule 1 has now been set at naught. 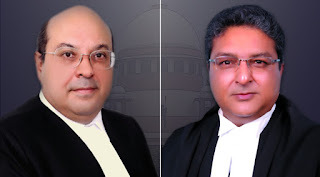 12) However, learned counsel appearing for the respondents relied strongly upon the judgment in Bhanu Kumar Jain (supra) and Shaikh Salim Haji Abdul Khayumsab (supra) and, in particular, paras 22 and 27 of the first judgment and paras 4 & 19 of the second judgment. 13) We are of the view that since both these judgments dealt with the pre-amendment position, they would not be of any direct reliance insofar as the facts of the present case is concerned. 14) Learned counsel appearing for the respondents also relied upon R.K. Roja vs. U.S. Rayudu and Another (supra) for the proposition that the defendant is entitled to file an application for rejection of plaint under Order VII Rule 11 before filing his written statement. We are of the view that this judgment cannot be read in the manner sought for by the learned counsel appearing on behalf of the respondents. Order VII Rule 11 proceedings are independent of the filing of a written statement once a suit has been filed. In fact, para 6 of that judgment records “However, we may hasten to add that the liberty to file an application for rejection under Order 7 Rule 11 CPC cannot be made as a ruse for retrieving the lost opportunity to file the written statement”. 15) Learned counsel appearing for the respondents then argued that it cannot be assumed that the learned Single Judge did not know about these amendments when he passed the first impugned order dated 05.12.2017. We do not wish to enter upon this speculative arena. He then argued that since this judgment permitted him to file the written statement beyond 120 days, it was an act of the Court which should prejudice no man. This doctrine cannot be used when the res is not yet judicata. The 05.12.2017 order is res sub judice inasmuch as its correctness has been challenged before us. “The suit at Indore which had been instituted later, could be stayed in view of s.10 of the Code. The provisions of that section are clear, definite and mandatory. A Court in which a subsequent suit has been filed is prohibited from proceeding with the trial of that suit in certain specified circumstances. When there is a special provision in the Code of Civil Procedure for dealing with the contingencies of two such suits being instituted, recourse to the inherent powers under s.151 is not justified...” (at page 470) Clearly, the clear, definite and mandatory provisions of Order V read with Order VIII Rule 1 and 10 cannot be circumvented by recourse to the inherent power under Section 151 to do the opposite of what is stated therein. 17) Clearly, therefore, the 05.12.2017 order which applies in the face of the amendments made to the Civil Procedure Code cannot be sustained. When we come to the second order dated 24.09.2019, the only reason for this order is that 05.12.2017 has attained finality. “(ii) An issue of law which arises between the same parties in a subsequent suit or proceeding is not res judicata if, by an erroneous decision given on a statutory prohibition in the former suit or proceeding, the statutory prohibition is not given effect to. This is despite the fact that the matter in issue between the parties may be the same as that directly and substantially in issue in the previous suit or proceeding. This is for the reason that in such cases, the rights of the parties are not the only matter for consideration (as is the case of an erroneous interpretation of a statute inter parties), as the public policy contained in the statutory prohibition cannot be set at naught. This is for the same reason as that contained in matters which pertain to issues of law that raise jurisdictional questions. We have seen how, in Natraj Studios (AIR 1981 SC 537) (supra), it is the public policy of the statutory prohibition contained in Section 28 of the Bombay Rent Act that has to be given effect to. Likewise, the public policy contained in other statutory prohibitions, which need not necessarily go to jurisdiction of a Court, must equally be given effect to, as otherwise special principles of law are fastened upon parties when special considerations relating to public policy mandate that this cannot be done.” The aforesaid para applies on all fours to the facts of the present case, as even assuming that the 05.12.2017 order is final, res judicata cannot stand in the way of an erroneous interpretation of a statutory prohibition. The present is one such case. Therefore, the second order must also be set aside. 3. The controversy is with regard to the application of the amended provisions of the said Act. The amendments to, inter alia, Sections 34 and 36 of the said Act were brought about by the Arbitration and Conciliation (Amendment) Act, 2015 (hereinafter referred to as 'the Amending Act') with retrospective effect from 23.10.2015. It is the case of the petitioners that the petitions under Section 34 of the said Act would be governed by the unamended provisions of, inter alia, Sections 34 and 36 and, therefore, the petitioners would have the right of an automatic stay on the filing of the petitions under Section 34 of the said Act. On the other hand, the respondents argue that the amended provisions would apply and, therefore, there would be no question of any automatic stay and that it was well within the powers of the learned single Judge to have required the petitioners to make a deposit of Rs 2.7 crores and to direct that in case such a deposit was not made, the petitions under Section 34 of the said Act would be liable to be dismissed. "26. Nothing contained in this Act shall apply to the arbitral proceedings commenced, in accordance with the provisions of section 21 of the principal Act, before the commencement of this Act unless the parties otherwise agree but this Act shall apply in relation to arbitral proceedings commenced on or after the date of commencement of this Act." 5. At this juncture, it would be necessary to also set down the differences in Section 36 of the said Act, pre and post-amendment:- Pre-amendment Post-amendment 36. Enforcement. - Where 36. (1) Where the time for the time for making an making an application to set application to set aside the aside the arbitral award under arbitral award under section section 34 has expired, then, 34 has expired, or such subject to the provisions of application having been sub-section (2), such award made, it has been refused, the shall be enforced in award shall be enforced accordance with the under the Code of Civil provisions of the Code of Procedure, 1908 (5 of 1908) Civil Procedure, 1908, in the in the same manner as if it same manner as if it were a were a decree of the Court. decree of the court. (2) Where an application to set aside the arbitral award has been filed in the Court under section 34, the filing of such an application shall not by itself render that award unenforceable, unless the Court grants an order of stay of the operation of the said arbitral award in accordance with the provisions of sub- section (3), on a separate application made for that purpose. (3) Upon filing of an application under sub-section (2) for stay of the operation of the arbitral award, the Court may, subject to such conditions as it may deem fit, grant stay of the operation of such award for reasons to be recorded in writing: Provided that the Court shall, while considering the application for grant of stay in the case of an arbitral award for payment of money, have due regard to the provisions for grant of stay of a money decree under the provisions for grant of stay of a money decree under the provisions of the Code of Civil Procedure, 1908. 6. There is no dispute with the proposition that if the pre-amendment provisions of Section 36 of the said Act were to apply, the very filing and pendency of a petition under Section 34would, in effect, operate as a stay of the enforcement of the award. This has been materially changed by virtue of the amendment brought about in Section 36 of the said Act. The post-amendment scenario is that where an application to set aside an arbitral award is filed under Section 34 before a court, the filing of such an application would not by itself render the award non-enforceable unless the court granted an order of stay of operation of the arbitral award in accordance with the provisions of Section 36(3) on a separate application made for that purpose. Sub-section (3) of Section 36 stipulates that upon the filing of an application for stay of operation of the arbitral award, it would be open to the court, subject to such conditions, as it may deem fit, to grant stay of operation of the award for the reasons to be recorded in writing. The proviso thereto requires the court, while considering the application for grant of stay in the case of an arbitral award for payment of money, to have due regard to the provisions for grant of stay of a money decree under the provisions of the Code of Civil Procedure, 1908. (e) affect any investigation, legal proceeding or remedy in respect of any such right, privilege, obligation, liability, penalty, forfeiture or punishment as aforesaid, and any such investigation, legal proceeding or remedy may be instituted, continued or enforced, and any such penalty, forfeiture or punishment may be imposed as if the repealing Act or Regulation had not been passed. 8. It was submitted in the context of Section 6 of the General Clauses Act that a repeal of an enactment would not affect any right acquired or accrued under the repealed enactment, unless a different intention appears in the repealing Act. It was contended that Section 26 of the Amending Act does not express any intention of retrospective application prior to 23.10.2015. It was further submitted that under the old provision, there was no requirement for a party objecting to the award and seeking the setting aside of the award to separately ask for stay of the award. The mere filing of the petition under Section 34 of the said Act entailed an automatic stay of the enforcement of the award. That vested right of automatic stay is no longer available under the new Section 36. This, according to the learned counsel for the petitioners, would operate only prospectively, that is, to arbitral proceedings commenced after 23.10.2015 and not to arbitrations commenced prior to 23.10.2015. 9. It was further contended on the strength of the Supreme Court decision in the case of Hitendra Vishnu Thakur and Others etc. etc. v. State of Maharashtra and Others: 1994 (4) SCC 602 that a statute which affects substantive rights is presumed to be prospective in operation, unless made retrospective, either expressly or by necessary intendment. Furthermore, the law relating to forum and limitation is procedural in nature, whereas the law relating to action and right of appeal, even though remedial, is substantive in nature. This, according to the learned counsel for the petitioners, would cover petitions under Section 34 of the said Act. 10. The Supreme Court decision in Jose Da Costa and Another v. Bascora Sadasiva Sinai Narcornim and Others: 1976 (2) SCC 917 was also referred to by the learned counsel for the petitioners to contend that the provisions which touch a right in existence at the time of passing of a statute, are not to be applied retrospectively in the absence of express enactment or necessary intendment. 11. Reliance was also placed on Thirumalai Chemicals Limited v. Union of India and Others: 2011 (6) SCC 739, wherein it was held that though it may be true that amendments to procedural laws can be applied retrospectively, procedural statutes which affect the rights of the parties, cannot be applied retrospectively. 12. In this backdrop, it was submitted by the learned counsel for the petitioners that substantive rights of the petitioners have been affected by the amendments brought about by the Amending Act. For instance, the new provision of Section 34 restricts the scope for challenge to an award as compared to the earlier provisions of Section 34. Secondly, the new Section 36 takes away the right of automatic stay which existed under the old Section 36. This is so as now a party has to seek a stay by way of an application under Section 36(2) of the new provisions and conditions could be imposed on the parties even where the court grants a stay of the enforcement of the award. 13. It was next contended by the learned counsel for the petitioners that Section 26 of the Amending Act does not indicate any intention of retrospective application of the amended provisions. 36. Enforcement.—Where the time for making an application to set aside the arbitral award under section 34 has expired, or such application having been made, it has been refused, the award shall be enforced under the Code of Civil Procedure, 1908 (5 of 1908) in the same manner as if it were a decree of the Court. “36. (1) Where the time for making an application to set aside the arbitral award under section 34 has expired, then, subject to the provisions of sub-section (2), such award shall be enforced in accordance with the provisions of the Code of Civil Procedure, 1908, in the same manner as if it were a decree of the court. 1. The provisions of the old Act (Arbitration Act, 1940) shall apply in relation to arbitral proceedings which have commenced before the coming into force of the new Act (the Arbitration and Conciliation Act, 1996). 2. The phrase ―in relation to arbitral proceedings‖ cannot be given a narrow meaning to mean only pendency of the arbitration proceedings before the arbitrator. It would cover not only proceedings pending before the arbitrator but would also cover the proceedings before the court and any proceedings which are required to be taken under the old Act for the award becoming a decree under Section 171 thereof and also appeal arising thereunder. 3. In cases where arbitral proceedings have commenced before the coming into force of the new Act and are pending before the arbitrator, it is open to the parties to agree that the new Act be applicable to such arbitral proceedings and they can so agree even before the coming into force of the new Act. 4. The new Act would be applicable in relation to arbitral proceedings which commenced on or after the new Act comes into force. 5. Once the arbitral proceedings have commenced, it cannot be stated that the right to be governed by the old Act for enforcement of the award was an inchoate right. It was certainly a right accrued. It is not imperative that for right to accrue to have the award enforced under the old Act some legal proceedings for its enforcement must be pending under that Act at the time the new Act came into force. 6. If a narrow meaning of the phrase ―in relation to arbitral proceedings‖ is to be accepted, it is likely to create a great deal of confusion with regard to the matters where award is made under the old Act. Provisions for the conduct of arbitral proceedings are vastly different in both the old and the new Act. Challenge of award can be with reference to the conduct of arbitral proceedings. An interpretation which leads to unjust and inconvenient results cannot be accepted. ―23. Section 85(2)(a) of the new Act is in two limbs: (1) provisions of the old Act shall apply in relation to arbitral proceedings which commenced before the new Act came into force unless otherwise agreed by the parties, and (2) the new Act shall apply in relation to arbitral proceedings which commenced on or after the new Act came into force. The first limb can further be bifurcated into two: (a) provisions of the old Act shall apply in relation to arbitral proceedings commenced before the new Act came into force, and (b) the old Act will not apply in such cases where the parties agree that it will not apply in relation to arbitral proceedings which commenced before the new Act came into force. The expression ―in relation to‖ is of the widest import as held by various decisions of this Court in Doypack Systems (P) Ltd.2, Mansukhlal Dhanraj Jain3, Dhanrajamal Gobindram4 and Navin Chemicals Mfg5. This expression ―in relation to‖ has to be given full effect to, particularly when read in conjunction with the words ―the provisions‖ of the old Act. That would mean that the old Act will apply to the whole gambit of arbitration culminating in the enforcement of the award. If it was not so, only the word ―to‖ could have sufficed and when the legislature has used the expression ―in relation to‖, a proper meaning has to be given. This expression does not admit of restrictive meaning. The first 1988 (2) SCC 299 1995 (2) SCC 665 AIR 1961 SC 1285 1993 (4) SCC 320 limb of Section 85(2)(a) is not a limited saving clause. It saves not only the proceedings pending at the time of commencement of the new Act but also the provisions of the old Act for enforcement of the award under that Act. 24. The contention that if it is accepted that the expression ―in relation to‖ arbitral proceedings would include proceedings for the enforcement of the award as well, the second limb of Section 85(2)(a) would become superfluous. We do not think that would be so. The second limb also takes into account the arbitration agreement entered into under the old Act when the arbitral proceedings commenced after the coming into force of the new Act. 28. Section 85(2)(a) is the saving clause. It exempts the old Act from complete obliteration so far as pending arbitration proceedings are concerned. That would include saving of whole of the old Act up till the time of the enforcement of the award. This (sic Thus) Section 85(2)(a) prevents the accrued right under the old Act from being affected. Saving provision preserves the existing right accrued under the old Act. There is a presumption that the legislature does not intend to limit or take away vested rights unless the language clearly points to the contrary. It is correct that the new Act is a remedial statute and, therefore, Section 85(2)(a) calls for a strict construction, it being a repealing provision. But then as stated above where one interpretation would produce an unjust or an inconvenient result and another would not have those effects, there is then also a presumption in favour of the latter. 29. Enforcement of the award, therefore, has to be examined on the touchstone of the proceedings held under the old Act. 17. It was contended on behalf of the respondents that a Division Bench of the Calcutta High Court in Tufan Chatterjee v. Rangan Dhar: AIR 2016 Cal 213 and the Madras High Court in New Tirupur Area Development Corporation Limited v. Hindustan Construction Company Limited: [Application No.7674/2015 in O.P. 931/2015] have held that since Section 26 of the Amending Act uses the expression ―to arbitral proceedings‖ instead of ―in relation to arbitral proceedings‖, the legislative intent was to limit its scope and, therefore, the said Section 26 could not be extended to include post-arbitral proceedings (including court proceedings). It was submitted that the crucial difference is in the words ―in relation to‖ in Section 85(2)(a) of the said Act which are missing from the first part of Section 26 of the Amending Act. It was submitted that the Supreme Court in the decision in Thirumalai (supra) was also relied upon by the Calcutta High Court and the Madras High Court in the aforesaid judgments. It was, therefore, submitted that since the first part of Section 26 of the Amending Act uses the phrase ―to arbitral proceedings‖ as distinct from the expression ―in relation to arbitral proceedings‖ used in Section 85(2)(a) of the said Act, it would, therefore, have a restrictive meaning. 18. It was also contended that the aid to Section 6 of the General Clauses Act ought not to be resorted to because of the use of the restrictive phrase in Section 26. This implies that the legislature deliberately and intentionally kept the post-arbitral proceedings outside the application of the first part of Section 26 of the Amending Act. It was also contended that the remedy available to a party under Section 34 has not been taken away by the Amending Act and there are only slight changes to Section 34. It was submitted that the only vested right was with regard to the challenge to an arbitral award which has remained intact. Section 36 relates to the enforcement of the award. Even under the unamended provisions, the party in whose favour the award was made was entitled for enforcement of the award after the expiry of the period mentioned in Section 34 or after the dismissal of a petition under Section 34. It was contended that the disability of the party in favour of whom the award was made in executing the award during the pendency of the petition under Section 34 under the unamended provision only provided an interim relief and the same cannot be said to be a vested or accrued substantive right. It was further contended that, in any event, the interim relief has not been completely taken away and only the stay of enforcement of an award has been made a subject matter of an order of the court in place of an automatic stay. 19. For all these reasons, it was contended by the learned counsel for the respondents that no interference with the impugned order was called for and the appeals ought to be dismissed. 20. In rejoinder, it was submitted by the learned counsel for the appellants that the decision of the Calcutta High Court in Tufan Chatterjee (supra) sought to bifurcate the words contained in Section 26 of the Amending Act inasmuch as it distinguished the terms ―to arbitration proceedings‖ and ―in relation to arbitration proceedings‖ to contend that the former means only proceedings before the arbitral tribunal, whereas the latter refers to all proceedings including court proceedings post the award. It was contended that if this interpretation was to be accepted, it would lead to serious contradictions, especially in the interplay between Sections 9 and 17, where the court proceedings (in relation to arbitral proceedings which commenced before the amendment) would be under Section 9 of the new regime, and the arbitral proceedings (which commenced before the amendment) would have to be under the old regime (including Section 17). It was, therefore, contended that it would certainly not be the intention of the Legislature to have the arbitral tribunal and the courts apply different standards in relation to the same proceedings. 21. Consequently, it was submitted that insofar as the petitions under Section 34 of the said Act, which have been filed in the present matters, are concerned, they ought to be governed by the unamended provisions. 22. Let us now analyse Section 26 of the Amending Act. It is comprised of two parts. 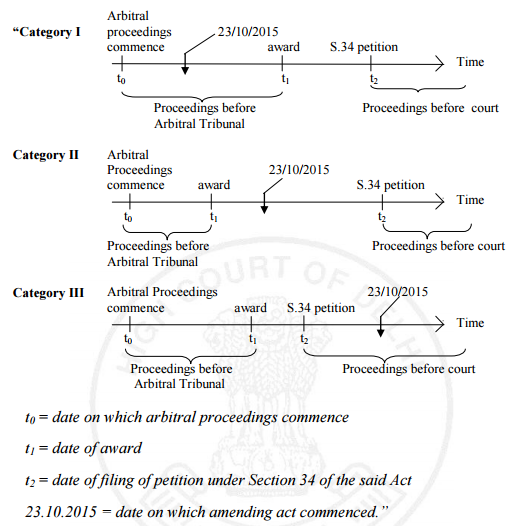 The first part stipulates that nothing contained in the Amending Act shall apply to the arbitral proceedings commenced in accordance with the provisions of Section 21 of the principal Act before the commencement of the Amending Act (i.e., on 23.10.2015), unless, of course, the parties otherwise agree. The second part makes it clear that the Amending Act and, consequently, the amendments brought about by it in the said Act shall apply in relation to arbitral proceedings commenced on or after the date of commencement of the Amending Act. It is, therefore, clear that Section 26 bifurcates cases on the basis of the commencement of the arbitral proceedings being ‗prior' or ‗on or after' the date of commencement of the Amending Act. In other words, the date of commencement of the Amending Act, that is, 23.10.2015, is what separates the two parts of Section 26. Insofar as the second part is concerned, there is and can be no confusion inasmuch as the Amending Act and consequently, the amendments brought about by it in the said Act, would clearly apply in relation to arbitral proceedings which commence on or after the date of commencement of the Amending Act (i.e., 23.10.2015). In other words, in cases of any arbitral proceedings which commence on or after 23.10.2015, the amendments would apply to the entire gamut of such proceedings. 23. An issue has been raised (and, was the subject matter of debate before us) as to whether there was any difference in the expressions ―to the arbitral proceedings‖ and ―in relation to arbitral proceedings‖ appearing in the two parts of Section 26 of the Amending Act. It was contended on behalf of the respondents that the expression ―in relation to arbitral proceedings‖ was referable to the entire gamut of arbitration culminating in the enforcement of the award and that the expression related not only to proceedings before the arbitral tribunal, but also to the proceedings emanating therefrom before the court. This was contended on the basis of the Supreme Court decision in Thyssen Stahlunion (supra). It was also contended on the strength of an observation in the said decision that if it was not so, only the word ―to‖ could have sufficed. It may be recalled that in that decision, Section 85(2)(a) of the said Act had come up for interpretation. That provision also comprised of two parts. But, in both parts, the expression used was ―in relation to arbitral proceedings‖. In that context, the Supreme Court had observed that the expression ―in relation to‖ did not admit of a restrictive meaning and that the first limb of Section 85(2)(a) was not a limited saving clause as it saved not only the proceedings pending at the time of commencement of the Arbitration and Conciliation Act, 1996, but also the provisions of the Arbitration Act, 1940 for enforcement of the award under that Act (i.e., the 1940 Act). It was contended on behalf of the respondents that in Section 26 of the Amending Act, while the expression ―in relation to arbitral proceedings‖ is used in the second part, in the first part the expression employed is ―to the arbitral proceedings‖. It was, therefore, contended that the first part of Section 26 which saved the unamended provisions of the said Act only had reference to arbitral proceedings, i.e., proceedings before an arbitral tribunal and not to any other proceedings emanating from or related to such arbitral proceedings, including proceedings before court. 24. It is to be seen as to whether the two limbs of Section 26, if interpreted in the manner suggested by the respondents, exhaust all the categories of cases. To put it differently, does Section 26 of the Amending Act deal with all types of cases, which could fall for consideration under the said Act. It is clear that insofar as the second limb of Section 26 is concerned, it takes within its fold every type of situation, which may arise in relation to arbitral proceedings, including both proceedings before the arbitral tribunal and court proceedings in relation thereto or connected therewith. Therefore, insofar as the second limb is concerned, there is no dispute that for all arbitration proceedings commenced on or after 23.10.2015, the Amending Act would apply and, therefore, the amended provisions of the said Act would be applicable. 25. This leaves us to consider the first part of Section 26. This part saves the application of the unamended provisions of the said Act to arbitral proceedings. 26. Let us assume, for the time being, that the expression ―arbitral proceedings‖ covers only those proceedings which are pending before the arbitral tribunal and not to other proceedings which may be pending before court or are in the process of being instituted in court. If this interpretation were to be accepted, then it would be clear that those situations, where arbitral proceedings commenced prior to 23.10.2015, but were not pending before the arbitral tribunals, would have no reference either in the first part or the second part of Section 26 of the Amending Act. 28. Given the three categories of cases, if the interpretation of the respondents is accepted, then the first part of Section 26 would only deal with the first category. In other words, there would be nothing in Section 26 of the Amending Act which pertained to the second and third categories of cases. 29. In such a situation, it would have to be considered, independent of Section 26 of the Amending Act, as to whether the amended provisions applied to the said second and third category of cases. In this regard, we may note the observations of the Supreme Court in Thyssen (supra) where, after, considering several earlier decisions, the Supreme Court observed in paragraph 32 (which we have already extracted above) that the principles enunciated in the judgments show as to when a right accrues to a party under a repealed Act. The Supreme Court observed that it is not necessary that for the right to accrue, legal proceedings must be pending when the new Act comes into force. Furthermore, and more importantly, the Supreme Court observed that to have the award enforced when arbitral proceedings commenced under the old Act under that very Act was certainly an accrued right. In other words, all the aspects of enforceability of an award entail an accrued right both in the person in whose favour the award is made and against whom the award is pronounced. It will also be noticed that the Supreme Court made it clear that for the right to accrue, there is no necessity that legal proceedings must be pending when the new Act comes into force. This exactly covers the situation as obtaining in the second category of cases, where the arbitral proceedings were commenced prior to 23.10.2015 and the award was also made prior to 23.10.2015, but the petition under Section 34 had not yet been filed. This is the same situation as in the present case. Thus, the pendency of any legal proceedings or otherwise would not come in the way of determining as to whether the right had accrued under the unamended provisions or not. We have already noted that the Supreme Court in Thyssen (supra) observed that the right to have the award enforced (which also comprises of the negative right of the award debtor to not have it enforced till his objections under Section 34 of the said Act are heard and decided) is certainly an accrued right. Given the fact that the amended Section 36 takes away the right of an automatic stay of enforcement of an award, it is clear that the amendment introduced in Section 36 by virtue of the Amending Act would definitely impinge upon the accrued right of the party against whom the award is given after the arbitral proceedings have been held under the unamended provisions. Since an accrued right is affected, unless a contrary intention appears in the amending statute, the amendments would have to be treated as prospective in operation. Prospective from the standpoint of commencement of the arbitral proceedings. 30. Now, if the argument of the respondents is to be accepted that the first limb of Section 26 applies only to arbitral proceedings in the sense of proceedings before arbitral tribunals and not to court proceedings, then, it is obvious that Section 26 is silent with regard to the second and third categories of cases to which we have already referred above. In other words, in respect of these categories, no contrary intention of retrospectivity is evinced upon a reading of Section 26 of the Amending Act. Therefore, even if we take the argument of the respondents to be correct, the result would still be the same and, that is, that in respect of all the arbitral proceedings commenced prior to 23.10.2015, the unamended provisions of the said Act would continue to operate till the enforcement of the award. 31. We may also notice that in case the argument of the respondents is to be accepted that where arbitral proceedings commenced prior to 23.10.2015, the unamended provisions would be saved only in respect of the proceedings before the arbitral tribunal and would not extend to court proceedings, the same would result in serious anomalies. This is so because the Amending Act has sought to bring about amendments in Section 9 as well as Section 17 of the said Act. While Section 9 pertains to interim measures which may be directed by the court prior, during arbitral proceedings or after the making of the award, Section 17 deals with the interim measures which may be ordered by an arbitral tribunal. If the interpretation of the respondents is to be accepted, then, in respect of arbitral proceedings commenced prior to 23.10.2015, the amended provisions would apply to proceedings under Section 9 of the said Act, but not to Section 17 thereof. This would result in a serious anomaly. 32. On the other hand, if the expression ―to the arbitral proceedings‖ used in the first limb of Section 26 is given the same expansive meaning as the expression ―in relation to arbitration proceedings‖ as appearing in the second limb of Section 26, then, the matter becomes very simple and does not result in any anomaly. All the arbitral proceedings (and here we mean the entire gamut, including the court proceedings in relation to proceedings before the arbitral tribunal), which commenced in accordance with the provisions of Section 21 of the said Act prior to 23.10.2015, would be governed, subject to an agreement between the parties to the contrary, by the unamended provisions and all those, in terms of the second part of Section 26, which commenced on or after 23.10.2015 would be governed by the amended provisions. 33. In view of the above analysis and discussion, we regret our inability to agree with the view taken by the Calcutta High Court in Tufan Chatterjee (supra). It must be reiterated that in the said Calcutta High Court decision, the second and third categories of cases mentioned above was not considered at all. Consequently, the arguments of the respondents based on the reasoning adopted in Tufan Chatterjee (supra) cannot be accepted. 4) As a result, the petitions filed by the appellants under Section 34 of the said Act would have to be considered under the unamended provisions of the said Act and consequently, the appellants would be entitled to automatic stay of enforcement of the award till the disposal of the said petitions. 35. In sum, the impugned order, to the extent it imposes a condition on the appellants / petitioners to deposit a sum of Rs 2.7 crores, is set aside. There shall be no requirement of the petitioners depositing / paying a sum of Rs 2.7 crores or any other sum as the filing of the petitions under Section 34 themselves would amount to automatic stay under the unamended provisions of Sections 34 and 36 read together. The appeals are allowed to the aforesaid extent. There shall be no order as to costs.